forests, and likes soils high in organic matter. Understory species, indicator or dominant in forest community and habitat types. Tsuga heterophylla, Pinus monticola, Abies grandis, Pseudotsuga menzeisii, Thuja plicata, Adenocaulon bicolor, Clintonia uniflora, Coptis occidentalis. Collect seed in July/August; pay special attention and look for empty seed coats, as this as been an issue for two other spp. 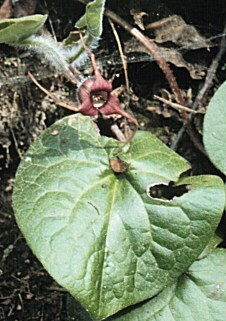 of Asarum. Divide rhizomes in early spring or fall, when plant is dormant. Take root cuttings in summer. These seeds require no scarification, but may require first a warm, then a cold/moist stratification to simulate climatic changes from when seeds are sown (typically in April) until their normal emergence the next spring. Can be stored for a short time with reasonable expectation of germination success. Store in cool dry space, like refrigerator, for fall and winter after harvesting; sow outdoors in April for plants the following spring. Due to high frequency of unviable/absentee seeds, I would recommend propagating by rhizome divisions, because this method can be done either in early spring or in fall, allowing for easy, reliable reproduction within a broad time range. If propagating from seed, pay special attention to emergence, as death of the radicle tips causes high mortality in other spp. of Asarum seedlings. Germinated seedlings should be transferred immediately to high OM media and kept outdoors. For root cuttings, these should be started in a sand medium and planted out in the fall. No innoculum necessary. Rhizome – also free; can be taken at two times during the year, which allows for flexibility in restoration project timelines; consistently propagated with success. Root cuttings – can be taken only during summer, and must be planted in fall; high potential for success of plants. Plant 1 cm deep with the tip of the rhizome at soil level. Space about 30cm (1ft.) apart. Mulch planted rhizomes to ensure adequate moisture; as they prefer naturally wet environments, additional watering should not be necessary. Slow-growing plant, but readily self-propagates by seed when established. Deno, Norman C. Seed Germination Theory and Practice, Aug. 1991. Landscaping with Western Washington Native Plants. Portland: Timber Press, 1986. Rose, Robin et al. Propagation of Pacific Northwest Native Plants. Corvallis: OSU Press, 1998.